Optimized space. Optimized output. 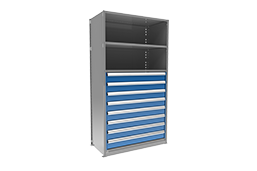 Maximize your profit per square foot with a MS Series modular drawer cabinet. With full height sidewalls, 14 gauge drawer face and Delrin® rolling system, Metalia's drawer cabinets are the most heavy-duty in the industry and allow you to transform up to 70% of the space used by regular shelves into profit making floor space. 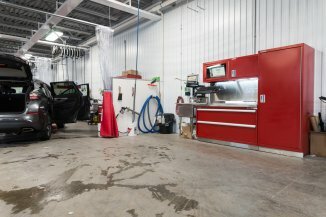 Using Metalia drawers provides a better inventory control, facilitates the organization of your working environment and significantly increases its cleanliness. Keep the most popular items at hand, increase your productivity and your picking rate by 25%. 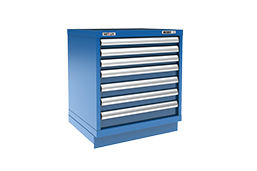 Combine our reliable strong-built drawers and cabinets to your own existing shelves. Unlimited configurations, amazing strength and durability, high-end looks: this is the promise of the WRS workstations. 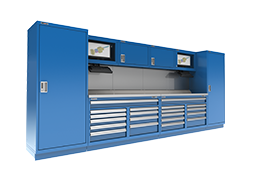 Automotive and industrial users will benefit from our patented handle with digital lock and double-walled cabinet doors designed to boost your productivity and organization. Discovers why we're said to be the best workstations in the world. 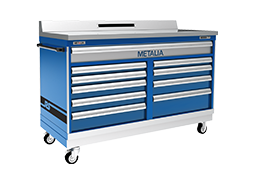 Meet the MRS: Professional grade toolboxes designed for the new generation of high-performance mechanics! With 440 lb of capacity per drawer, 14 gauge drawer face, solid aluminum handle and unlimited personalization options, the MRS lineup is the ultimate tool storage system.